We were recently contacted by an existing customer of ours, Mirman School, for a new plaque for the campus. From the photos, you can see that the metal finish of the signs blends in very well with the scoreboard that the plaque was made for. Silver-toned metal is a very popular choice for signs because it can suit many different existing interior and exterior designs. The first step we took after the customer contacted us about the new sign was to go out to the location and measure the sign area. Whether or not the client has the desired size determined, we always like to get the exact measurements ourselves so we can make sure that the sign will look good in the space we have, and so we can provide accurate renderings once we are in the proofing process. Regarding the design, we had actually made some plaques for them previously so they asked us to match their existing plaques and provided us with vector artwork. When a customer knows exactly what they want ahead of time, and has a designer that can create vector artwork, the whole process goes very quickly because we usually have a minimal number or revisions that need to be made. There was only one revision we made for this sign. As we knew that the space we had to work with was 20″ wide, we initially laid out a 20″ wide sign that was wider than it was tall. After seeing a mockup in the proof, the client decided that they wanted the sign to be taller and thinner, so we adjusted the proportions a little bit to get the end result you see here. 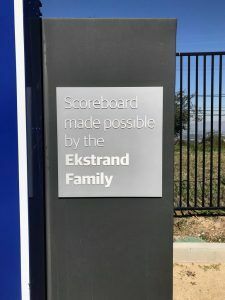 Click here to learn more about the previous plaques that we made for Mirman School. There were four plaques in total that included the school logo, and names of families and individuals who had donated to the school.